Viator bruger cookies for at forbedre din oplevelse på websitet. Læs mere, eller ændr dine indstillinger. Ved at fortsætte accepterer du vores cookies. 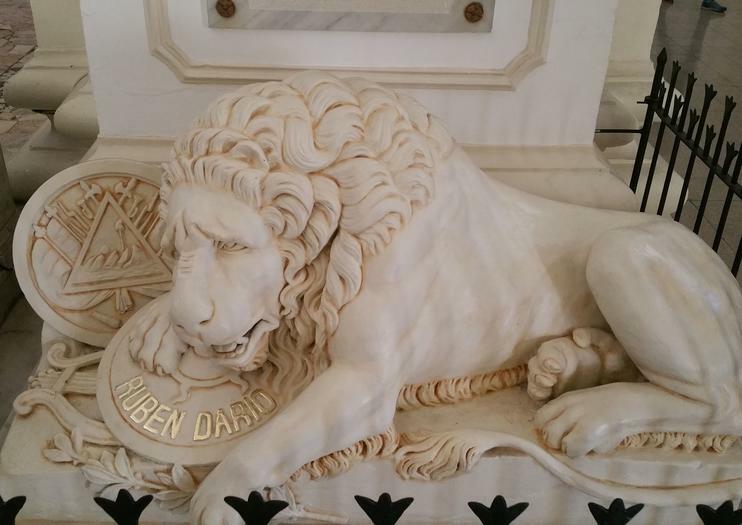 The Rubén Darío Museum (Museo Rubén Darío) is dedicated to the famous poet, writer, and ambassador who brought modernismo to Spanish literature. A must for poetry fans, this León museum is also a good choice for those curious about Nicaraguan history—the museum offers an intimate look at 19th-century upper-class life in Nicaragua. Walk through the house—Darío’s childhood home—and see the poet’s manuscripts and everyday trappings such as his bible, photos, work suits, and bed. The well-preserved rooms and courtyard also offer a glimpse into what life was like for Nicaragua’s well-to-do in the late 19th century. Signs with information about the exhibits are in Spanish. Unless you go to the Rubén Darío Museum as part of a guided tour, visits are self-guided. If you’re based in Managua or Granada, you can visit León on a day trip. The Rubén Darío Museum is ideal for poetry and history buffs. Plan to spend roughly an hour at the museum. Though entrance is free, donations are strongly recommended. Visit with a guide to make the most of the tour, especially if you have limited Spanish. The Rubén Darío Museum is centrally located in León, on the corner of Calle de Rubén Darío and Avenue 4. You might pass by it walking through León’s historic center, or you can hire a cab if coming from another part of town. The museum is open from 8am to 12pm and 2pm to 5pm Tuesday to Saturday, and from 8am to 12pm on Sunday. Try visiting in the middle of the day for a reprieve from León’s infamous heat. León city tours often include the Rubén Darío Museum in addition to other top sights around Nicaragua’s colonial city like the San Francisco Church (Iglesia de San Francisco), León Cathedral (Catedral de León or Basílica de la Asunción)—the largest cathedral in Central America, a UNESCO World Heritage Site, and the burial place of Rubén Darío—and other specialty museums. Berig din oplevelse af Leon på en dagstur i kolonistaden. Ved siden af ​​din guide vil du dykke ind i Leon's koloniale historie og besøge seværdigheder som UNESCO-noteret La Asuncion Cathedral og Ortiz Gurdian kunstgalleri. Se også fødestedet for Ruben Dario - hyldet som far til spansk poesi - og forstå den rolle Leon spillede i Nicaraguas sociale og politiske omdannelse. På denne lille gruppe tur, begrænset til 15 personer, vil du modtage personlig opmærksomhed fra din guide. I denne private 4-dages tur vil du besøge Leon, hvor du vil opleve den perfekte blanding af kolonial kultur og historie samt nogle ekstra aktiviteter som besøg på en sandstrand eller besøge destilleriet af en af ​​de bedste rummer af verden, Flor de Cana. Fritids eftermiddag vil lade dig blande med lokalbefolkningen, smag lokale retter og bare slappe af i dens centrale park beundrer den imponerende katedral, den største i Mellemamerika.